The period where heart failure (HF) patients are at a higher risk of death or rehospitalization for HF after an episode of decompensation is known as ‘vulnerable phase’. This comprises the “peri-acute” period and is a time when microenvironmental changes occur affecting the cardiovascular system1. Typically, the vulnerable phase spans from the onset of an acute HF event –often leading to hospital admission, and up to six months after discharge1,2. 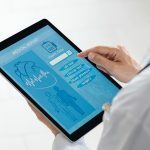 Although the exact mechanisms leading to patient hospital readmission are not fully understood, many precipitating factors have been identified, including persistent congestion, end-organ damage and certain comorbidities3. Despite the increased risk for adverse outcomes, the vulnerability phase has also been regarded as a “window of opportunity” as, with appropriate management, a phase of long-term stability can be expected in many individuals1. The vulnerable phase represents a continuum4 but is usually divided into three periods -that may be overlapping: 1. a very early phase, 2. an early phase, and 3. a late phase. The table represents this three periods; however, definition and duration rely exclusively on clinical features. Therapeutic goals4 based on the patient’s clinical characteristics can be prioritized in each of these phases. In a subanalysis of the PARADIGM-HF trial, Solomon et al emphasized that even clinically stable patients have higher absolute rates of cardiovascular death and of HF hospitalization5. They suggest that the use of the angiotensin receptor neprilysin inhibitor (ARNI) -sacubitril/valsartan- may be a suitable replacement for ACE inhibitor treatment. The authors divide the population sample in five groups according to the presence and time from last hospitalization for HF at the time of randomization (<3 months, 3-6 months, 6-12 months, >12 months, no prior HF-hospitalization). They follow the rationale of other HF trials, considering that rehospitalization after discharge and mortality are both important outcomes in acute HF trials and constitute a main performance measurement for a hospital6. 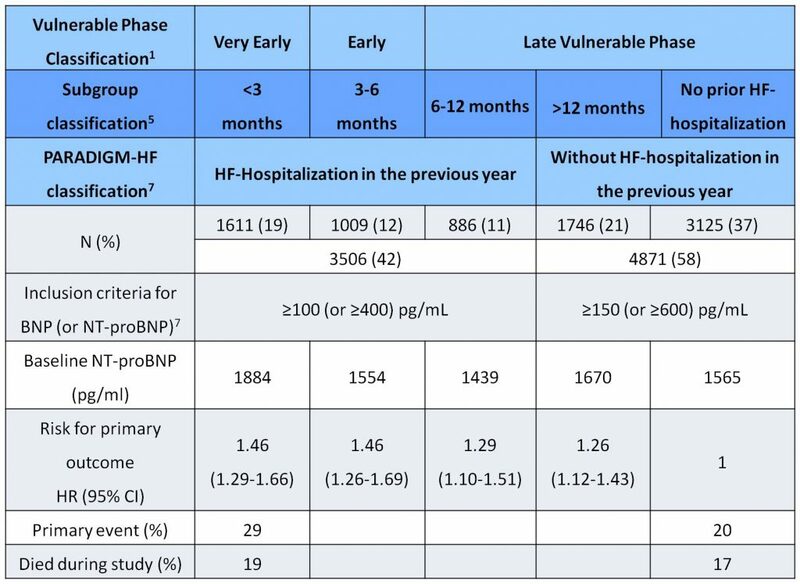 In their study, Solomon et al found that recent HF hospitalization resulted to be a marker of clinical instability, portrended increased risk for major adverse cardiovascular events in patients with HF, and this risk declined over time5. These findings were in line with the concept of the ‘vulnerable phase’ as a continuum. The table below shows the main differences between the five groups included in the article by Solomon et al5. Those five periods can be condensed in two, according to inclusion criteria of the PARADIGM-HF7. The parallelism of time-frames of both trial designs has been clarified in the Table. Although higher NT-proBNP levels were required for patients without HF-hospitalization in the previous year, these values significantly declined over time, paralleling clinical stability as defined in the methods (p=0.025). Regardless of treatment, the risk for the primary outcome (cardiovascular death or HF-hospitalization) was higher in patients with more recent hospitalization (p<0.0001 for trend). The benefit of sacubitril/valsartan was not affected by the presence or timing of prior hospitalization for HF. Patients in the very ‘late vulnerable phase’, defined as those without prior HF-hospitalization could be considered the most stable ones. However, 20% had a primary event and 17% died during the trial. This is a remarkable finding, meaning that even those patients considered the most clinically stable still have high absolute rates of cardiovascular death and of HF-hospitalization. Indeed, this subgroup of patients derived as much benefit from sacubitril/valsartan as other patients on the ‘vulnerable phase’, clearly proved to be a continuum. HF patients with reduced ejection fraction should be therefore regarded as a high risk population for HF-hospitalizations and death, with independence of their clinical status. The present article5 underscores the importance of early improvement of therapy in those patients who are likely to benefit from the use of an ARNI as a replacement for an ACE inhibitor. There are other interesting findings that would deserve a deeper analysis of the data, such as the possible differences in HF-origin (history of hypertension, higher rate of atrial fibrillation among early discharged patients, even being a younger group, higher rates of ischemic cardiomyopathy and prior myocardial infarction in patients without HF-hospitalization during the previous year), treatment differences (frequency of prescription of beta blockers declines over time-course of the disease?). A better understanding of the mechanisms underlying the poor prognosis of patients hospitalized for HF is needed; however, ‘physicians’ perception of clinical stability might not represent a reliable parameter to guide this approach. Early introduction of ARNI therapy may help provide better care and improve hospitalization and mortality in patients with HF and reduced ejection fraction. 1.- Yilmaz MB, Mebazaa A. Definition and characteristics of the vulnerable phase in heart failure. Medicographia 2015; 37(2): 1–5. 2.- Follath F, Yilmaz MB, Delgado JF, Parissis JT, Porcher R, Gayat E, Burrows N, McLean A, Vilas-Boas F, Mebazaa A. Clinical presentation, management and outcomes in the Acute Heart Failure Global Survey of Standard Treatment (ALARM-HF). Intensive Care Med. 2011-, 37(4): 619–626. 4.- Lopatin Y, Rosano G. Treatment of Patients in the Vulnerable Phase (at Discharge or Early After Discharge). International Cardiovascular Forum Journal 2017;10:37-40. 6.- Kociol RD, Liang L, Hernandez AF, Curtis LH, Heidenreich PA, Yancy CW, Fonarow GC, Peterson ED. Are we targeting the right metric for heart failure? Comparison of hospital 30-day readmission rates and total episode of care inpatient days. Am Heart J. 2013;165:987-994e1.